RALEIGH -- A woman spotted a snake slithering from the hood of her car while on her way to work Friday morning. Justyn Knox said she was driving down I-40, heading into downtown Raleigh when she saw the scaly creature on the hood of her car. 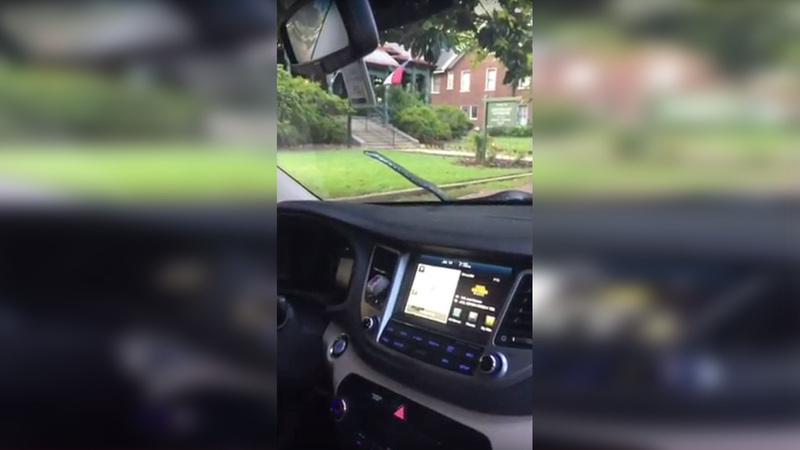 She quickly called animal control and then started recording a video as she parked on Blount Street in front of the Lieutenant Governor's office. Knox kept recording but crawled into the backseat of her SUV as she watched the snake make its way across the windshield toward the driver's side. "I was determined to go through the trunk if I had to," Knox said. "I was scared the snake was gonna come through the AC vent for some reason." Minutes later, she said the snake, which was about five to six feet long and solid black in color, used a low-hanging branch to slither up into a tree. Knox said animal control officers ended up not responding, telling her once the snake was in its natural habitat, there was nothing they could do. On Monday morning, she parked a block away, admitting that she was still nervous to walk by that tree. Now, she's warning everyone to be on the lookout. "The country snake is now a city snake," Knox said with an anxious smile. "I dropped him off at the Lt. Governor's mansion!"